In blender or food processor, puree all ingredients until smooth. 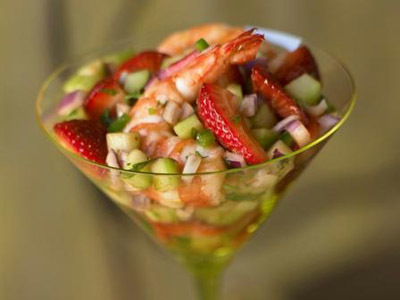 In large bowl, toss shrimp, cucumber, onion and peppers with Ceviche dressing. Refrigerate, covered, at least 30 minutes, but no more than 4 hours. Just before serving, add strawberries and cilantro; mix gently but thoroughly. Courtesy of the California Strawberry Commission. All rights reserved.